China's origins were long seen as being focussed along the Yellow River. Several of the early mythical or semi-historical dynasties were based in territory in this region, and these were regarded to have laid down the basis of later Chinese unity. However, archaeological discoveries in the past few decades have begun to shine a light on other cultures. These were located in regions that have been part of China for centuries but were initially seen as being outside the traditional Yellow River heartland of the earliest kingdoms. Discoveries of spectacular sacrificial pits in Sichuan, China's westernmost region, and Jiangxi, deep in the south, are connected with nearby city sites and have put a strain on the traditional view of Chinese cultural progression. In order to add these sites to the framework of Chinese history, archaeologists have begun to talk in terms of multiple sites of innovation that were all linked to Chinese civilisation. This has allowed Chinese archaeologists to break out of the constraints of working on areas within China's accepted cultural origins and instead search for multiple cultural origins in multiple regions. Those cultures emerged at different times and in different places. Progression from Neolithic settlement to imperial dynasties was far from smooth and was also not consistently upwards and onwards. As mentioned, the Yellow River region played a vital role in shaping China, although it was not the sole birthplace of Chinese culture and invention. To gain a more complete overview of the emergence of these cultures and the part they may have played in the creation of a Chinese state, a separate, Early Cultures page covers them in detail. The traditional view of the emergence of a single Chinese kingdom on a relatively narrow regional basis relied on the use of ancient Chinese chronicles. These recounted the lives and exploits of a succession of dynastic rulers that extended back to the start of the third millennium BC. However, the only surviving scrolls date from more than two thousand years later, so how much is fact and how much is reverent fiction may never be known. 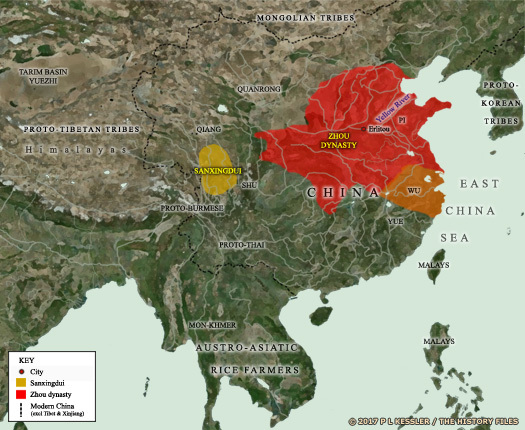 These early dynasties were drawn from a blending of small native tribes that developed and expanded until something approaching modern China (albeit much smaller in form) had been created. This dynastic interpretation of Chinese history has been used here as the basis for the main list, but the many regional kingdoms have also been added where appropriate, often as sideshoots of the main list with their own pages. Sub-kingdoms or regional kingdoms that are included here rather than on a page of their own are often shown with a shaded background to illustrate their separation from the dominant ruler(s) of contemporary China. Chinese spelling as interpreted by the rest of the world has undergone many changes in the centuries since regular direct contacts were established with Europe. What was an acceptable interpretation in the seventeenth century of the name of a Chinese kingdom or ruler was often shown entirely differently in the twentieth century. Since then, further revision and fine-tuning has taken place ('Peking' to 'Beijing', for example), with the result that individual names often have several interpretations in records old and new. An attempt has been made here to use the latest forms of ancient names, but the process of picking out the most accurate version can be complicated, and fraught with possible error. It may be the case that no one form of a name in English is entirely satisfactory, and all of them may be open to future revision. This legendary period precedes the general use of writing in China, although the origins of writing may go back very far indeed (see feature link, right). Also known as the 'Age of the Five Rulers' or emperors, and the 'Age of the Three Sovereigns', in the traditional Chinese chronology it is said to have lasted for 647 years. In linear terms it could be said to have followed many of the Chinese Early Cultures that combined to form the basis of what is now known as China, but may in fact have been little more than a regional kingdom with its own cultural expression. If any of these names represent once-living persons then they were likely local kings of some regional greatness who later achieved godhood through continued remembrance, but in the legendary sense they are used to show the 'creation' and progressive development of humanity in China. More than three sovereigns exist in the list, and more than five rulers, because not all sources agree on which names to include. In broad terms the legendary period owes something of its existence to the Yangshao and Longshan cultures (it could certainly be ascribed to the later part of the Longshan in terms of its dating), and perhaps could also be described as a kind of proto-Erlitou period. It immediately precedes the Hsia dynasty (the traditional dynastic name for the Erlitou culture), which has long been seen as China's first legitimate dynasty, so for that reason it is included here as the starting point for the emergence of Chinese history. None of its rulers can be confirmed in any way whatsoever as being historical. The first sovereign, a goddess-empress. Reigned 180,000 years. Sovereign god-emperor. Reigned 110,000 years. The Longshan culture succeeds the Yangshao on the Yellow River. This is the culture and time span to which belongs the legendary period that is seen to form the start of a continuous chain of dynasties, a view that is being challenged by archaeology and historians. Sovereign emperor. Reigned 456,000 years. Suìrén is perhaps the first name in the list of legendary emperors to be able to claim any semblance of reality. He is credited with the invention of drilling wood to create fire, a skill which is in fact known many thousands of years beforehand. Sovereign emperor. The 'Yán Emperor'. The 'Yán Emperor' and Shennong are shown here as the same person. This is a subject that has long been debated, with many scholars considering them to be entirely separate figures, but it was largely settled by Chinese academics in 2004 in favour of there being a single figure. His homeland has been linked to the Sheep's Head Mountains in today's Shaanxi Province in northern-central China, just to the north of Baoji. The title 'yán' means 'flame', and K C Wu has put forward the idea that it was the title borne by a dynasty of rulers, with Shennong being the first. Shennong may even be the name of this particular tribe, the Shennong-shi. The 'flame emperors' may have ruled for a total of five hundred years, although this seems excessive. 'Yán Emperor'. Positioned either here, or after Ai. 'Yán Emperor'. Defeated, and then in alliance with Huangdi. Yuwang is defeated by Huangdi in the last of three battles, ending the dynasty of flame emperors and beginning the reign of the Yellow Emperor. Whilst the list of flame emperors, above, is the standard one offered by Chinese scholars and officials - Huangfu Mi (AD 215-282), Sima Zhen (AD 679-732), and Xu Zheng (flourished during the Eastern Wu period) - the Classic of Mountains and Seas text (also known as the Shan Hai Jing) has a completely different list, as follows: Yandi, Jiebing, Xiqi, Zhurong, Gonggong, Shuqi, Houtu (brother of Shuqi), Yeming (son of Houtu), and Suishi. Sovereign emperor. The 'Yellow Emperor'. The cult of Huangdi is a particularly strong one during the 'Warring States' period, and again during the Early Han dynasty that follows it. Huangdi is portrayed as the creator of the centralised Chinese state, and the creator of several innovations that have probably already come about gradually during the course of China's early cultures. Sima Qian's Records of the Grand Historian begin with him, ignoring the earlier legendary rulers. Huangdi is to China's history what Woden of Angeln is to Anglo-Germanic history - almost every subsequent, historical king attempts to claim descent from him, but everything about him is hotly contested by historians. Son. Ruler of the Dongyi. 1st century AD addition to the list? Jintian-shi is ruler of the Dongyi, or Eastern Yi ('dong' means 'east' here). The use of 'yi' refers to people outside of the core group of Chinese micro-states, effectively labelling them as foreigners or barbarians. With the definition of what makes a Chinese state clearly changing over time, the use of 'yi' to describe outsiders is an adaptable one. In this period it refers to at least one group which is actually located in modern south-western China, at Qufu in Shandong Province which Jintian-shi makes his new capital. Nephew. 'High Brilliance'. Ruler of the Shi. Prior to becoming an emperor figure in his own right (at least in the terminology of later scholars), Gaoyang leads the Shi clan eastwards, with them migrating to Shandong where they settle alongside the Dongi tribe. The two groups are united through intermarriage and Gaoyang either succeeds Jintian-shi as their ruler at the age of twenty-four, or is chosen as the first leader of the newly combined tribe (as the inclusion of Jintian-shi in this list may be a first century AD addition). According to later claims Gaoyang (an honorific meaning 'High Brilliance') he is the ancestor of the rulers of Chu and the dukes of Qin. Grandson of Jintian-shi. The 'White Emperor'. Half-brother. Emperor. Abdicated in favour of Youyu. Yu the Great was the founder of the Xia or Hsia dynasty (pronounced syah), China's first historical dynasty (or at least semi-historical). However, no written records have survived from this early in Chinese history, presuming that the people of the Xia even had writing, which is highly debatable. The earliest known writing dates from the Shang dynasty, almost a millennium later, although this lack of written evidence does not preclude the existence of a powerful oral tradition that remembered one of China's key founder figures. 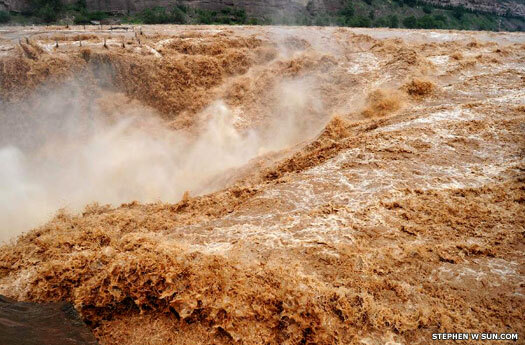 The Yellow River was both a boon to the tribes that lived along its banks and also a menace, because it could kill thousands when in full flood, and continued to do so right up to the modern age. According to tradition, Yu, grandson several times removed of the Yellow Emperor, managed to tame the river by building a great dam (with the help of a great dragon and a turtle), but it took him thirteen long years. Having returned home victorious, he earned the right to rule over the tribes along the river, and the Xia dynasty of emperors was born. 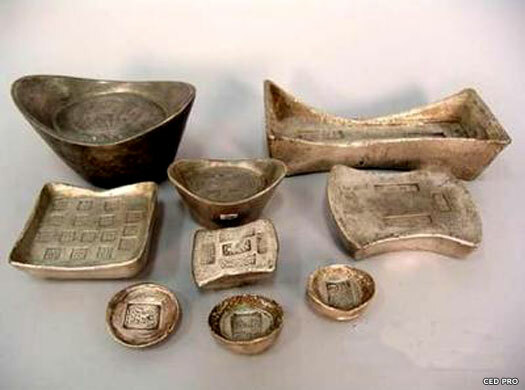 The legend of Yu and his taming of the Yellow River was long thought by historians to be a myth - that is until a bronze bowl inscribed with the story was unearthed by archaeologists and was dated to around 1000 BC, proving that the story existed in China's Bronze Age. Perhaps his achievements meant that he could rule by replacing the previous ruler, because the Bamboo Annals state that Yu rebelled against Shùn 'the Great', last of the Legendary Period's emperors, and seized the throne from him. Yu's capital was probably at the Bronze Age site of Erlitou (pronounced earl-ee-taow), now a small village in Henan Province that lies a little way south of the ancient settlement. The Erlitou Culture emerged in Upper China as an immediate successor to the Longshan culture and was located in the 'Middle Plain' of the 'Middle Land', the latter being China itself. The Erlitou culture, formed during the Xia era's heyday, had origins that dated back to the preceding Longshan and Yangshao cultures. Its emergence had lasting repercussions for all of Chinese culture, laying down several important principles which were followed thereafter. The Xia remain largely a mystery, but at Erlitou archaeologists continue to find intriguing clues to their identity and the two seem to be tied together in history and archaeology. For the moment, due to the lack of written evidence, selecting Erlitou as the capital of the Xia is still in doubt, as is the claim for the Xia forming China's first (historical or semi-historical) dynasty. All that has survived is oral tradition and a good deal of archaeology. It certainly does seem to have been an important dynasty, however, and sixteen emperors succeeded Yu before its end around 1766 BC. Descendant of the Legendary Period's Yellow Emperor. Son. Ruled 10, 16, or 29 years. Just north of the River Luo at Erlitou, archaeologists are still working on a site that has yielded great finds that date from this period onwards, to around 1500 BC. The finds include pillared halls, palaces that could be dated between 2000-1500 BC. These palaces stand on rammed-earth platforms, one of them with a triple gate that provides the pattern for all later Chinese royal cities. Pottery and bronze casting are found here, as is a burial with an exquisite sceptre made of two thousand pieces of turquoise in the shape of a dragon, the symbol of Chinese royalty since the beginning of civilisation here (similarly, the later post-Roman Britons also revere the dragon as a symbol of leadership or royalty). Son. Reignal name shown second. Reigned 19 years. The earliest recorded eclipse (at least, recorded by oral tradition and written down a thousand years later) is noted in the Book of Documents (the Shujing, earlier known as the Shu King). In the fifth year of the reign of Zhong Kang (usually shown without the letter accents) two royal astronomers, Hsi and Ho, fail in their duties to predict the eclipse and are executed by order of the king. The usual date given for Zhong Kang's accession is 2088 BC, which would make the year of the solar eclipse 2083 BC. However, the nearest solar eclipse of any type that can be found is at 2094 BC, for a hybrid eclipse on 5 January. The actual figure given is 2093 BC, but this is an astronomical date which does not take into account the non-existence of a year zero, so one year must be added on. Therefore Zhong Kang's reign must begin in 2099 BC. Xiāng is murdered by Jiao, the son of the warlord, Han Zhuo. The father had already conquered Ge, and six years later he now empties the Xia throne. There follows an interregnum of around forty years while Xiāng's wife raises their infant son to adulthood and he is able to reclaim his father's throne from Han Zhuo. Ge is retaken, Jiao is killed, and Han Zhuo is executed. Usurper warlord who seized the throne. Executed. Son of Xiāng. Restored the Xia throne. One of Shào Kāng's sons, Wuyi, is credited with bringing civilisation to the Yue on the East China Sea coast of China, at Zhejiang (formerly Chekiang). Otherwise known as Yuyue, the Yue state flourishes during the first millennium BC, most especially during the Middle Zhou period and the Warring States era. Through their connection via Wuyi, Yue's rulers later claim descent from Emperor Yu. During the thirteenth year of Zhù's reign his vassal, Ming of the Shang tribe, dies. The Shang occupy the lower regions of the Yellow River, to the immediate north-east of the Xia dynasty's domains. This makes them potentially dangerous if they ever think of rising up against the Xia - which of course they do around 1766 BC. Son. Ruled 26 or 44 years. Son. Ruled 59 years. Abdicated. Died 10 years later. During the sixth year of his reign, according to the Bamboo Annals, Bu Jiàng fights the Mongols of Jiuyuan (now part of Inner Mongolia). In the thirty-fifth year of his reign his subject, the Shang, defeat the state of Pi (otherwise known as Xue, located in southern Shandong Province). The state had been created by Xi Zhong, Yu's minister of chariots, but details regarding it seem to have been lost to history. The state resurfaces during the subsequent Shang period. At the end of his reign Bu Jiàng abdicates the throne in favour of his brother. Chinese rice and millet farmers spread southwards into a region which stretches between Vietnam and Burma. There, they interbreed with local hunter-gatherers in two main pulses, the first taking place around now and the second around the end of the first century BC. The migrations seem to occur from southern China which, at this time, is not part of the Erlitou culture of the north, but which may still be informed and improved by it. Brother. Ruled for 18 or 21 years? Son. Ruled for 21 years? Son of Bu Jiàng. Personal name unknown. Ruled 31 years? Dedicated to his personal pleasures rather than the good governance of the kingdom, Kǒng Jiǎ's reign sees the beginning of a decline in Xia power and influence. The vassal states begin to assert greater levels of independence. Son. A tyrant. Overthrown by the Shang. Jié is a tyrant who, in common with at least one recent ruler, is intent on securing his own pleasures above his duty to govern the kingdom. During this time the Shang state is increasing its own power by dominating other, neighbouring Xia vassal states one by one, including Ge (modern Ningling, Henan Province), Wei (modern Huaxian, Henan Province), Gu (modern Fanxian, Henan), and Wen. The Shang ruler, Tang, eventually convinces the other vassal states to join him in overthrowing the Xia and its corrupt leader. Jié's last solid ally, Kunwu (modern Xuchang, Henan), is defeated and the attack on the Xia themselves finally comes at the Battle of Mingtiao. Jié flees the defeat and is soon captured and allowed to live, only later to die of illness. Prior to their ascent as conquerors of the Xia, the Shang formed a tribe which occupied the lower regions of the Yellow River during Xia dominance. Their kingdom, which gradually transformed from tribal to Bronze Age state, was dominated by the Xia for at least a couple of centuries, with their earliest-known ruler being Ming, who died during the reign of Xia Emperor Zhù. During the tyrannical rule of Jié, the last of the Xia, the Shang established their own dynasty under 'King Tang'. The dates given for this are varied, as several alternate chronologies have been put forward. Apart from 1766 BC, three further dates - 1675 BC, 1523 BC, or even a dynasty span of 1600-1046 BC - have been proposed. The Shang dynasty lasted for at least five hundred years (according to oral tradition that was only written down in the ninth century BC), and was witness to thirty different emperors. As the capital of the Shang was later based at Yin (modern Xiaotun Village, in Anyang City, Henan Province), the dynasty is also known as the 'Yin Shang'. They controlled the whole of central China, roughly incorporating the modern Shandong Province and the southern part of Hebei in the north, and Jiangxi and Hubei provinces towards the south, with Henan and Anhui in the middle. It was here that the earliest known form of Chinese script was developed. Initially it was used by diviners inscribing runes on cracks of tortoise shell in order to understand the wishes of the ancestors, but the characters they used are direct ancestors of modern Chinese writing. The dynasty's centre, and holy place, was at Shangqiu. They returned here repeatedly to conduct ceremonies and to attempt to understand the cosmos in order to better their hold on power. Unfortunately, some of their subject peoples were forced to provide victims for sacrifices, all part of the ritual to grasp the meaning of heaven and obtain its sympathetic mandate. Chinese names are often subject to some revision over time (perhaps most famously with the 'Peking' of the 1950s becoming the 'Beijing' of the 2000s). The names of this dynasty's rulers are no different, so two versions are offered here. The dynasty's start and end dates cover a span of 644 years. However, the number of years that each ruler was on the throne amounts to 663. This provides a discrepancy of nineteen years which are otherwise hard to account for, other than by there being an overlap at one end of the dynasty. Possibly this was the time it took for Shang Tang to establish his dynasty, or one or more kings shared the throne or took part in a regency. The names of the early kings themselves are also subject to some discussion and disagreement over their running order, thanks to early sources providing at least two opposing narratives. Founded the dynasty (or in 1675 BC). Reigned 30 years in total. It is probably Shang Tang's seizure of the imperial throne (or, in reality at this point in China's history, the senior kingship along the Yellow River and its surrounding territories), which alienates the state of Pi. Largely unrecorded by history, the state had been created by Xi Zhong, minister of chariots for Yu of the Xia dynasty. Now it begins a war against the new imperial court in protest at Shang control. The state of Pi is later defeated by the state of Peng. Wai Bing succeeds as the replacement to his deceased elder brother, Da Ding. Some of the ancient sources actually have Da Ding briefly succeeding their father before dying at a young age. Inscriptions on oracle bones also claim him as the second Shang king. Grandson of Tang. Reigned 33 years. Tai Jia is recorded as being autocratic, a leader who treats his people badly and fails to observe his own laws. In the end, Prime Minister Yi Yen is forced to banish him to Tong Palace in modern Yanshi County in Henan Province. Sources are mixed when it comes to Yi Yen. He either allows the repentant king back to the royal court after three years of solitude, or he usurps the throne and has to be overthrown after seven years of false rule. Either way, Tai Jia returns to the kingship a changed man. Dated to approximately 1700 BC, the palace discovered by archaeologists at the Erlitou Bronze Age site in Henan province may be a prototype for later Shang places of worship. It is the best-preserved palace ever found at the site, with rammed-earth foundations and at least three courtyards, and covers a total area of more than 2,100 square metres (2,297 square yards). The Erlitou site also contains cultural relics ranging from the Yangshao and Longshan cultures and the Xia dynasty. The age of harmony and peace which had been ushered in and maintained by the first few Shang rulers suddenly wanes under the latest of them. Conditions begin to deteriorate and there are multiple attempts by the emperor's own family to overthrow him and take command of the kingdom. Social problems begin to emerge and the emperor's power gradually declines. The Yong Ji who now reigns could also be the Lü Ji mentioned in oracle texts. It is estimated to be around this time that the Sanxingdui civilisation arises on the western edges of early Chinese culture. Its people create an impressive city on the banks of the Minjiang River, which probably replaces older, less impressive dwellings. Tsu-yi's reign of almost two decades witnesses the restoration of the dynasty's prosperity. He moves the capital to a fourth location for the Shang, this time to Keng, even though his father had only recently moved it to Hsiang. Keng is soon destroyed by flood so Tsu-yi moves to the city of Yen. This movement of the capital is unusual for any dynasty in any ancient kingdom, although the Yellow River may be responsible for at least some of it (besides flooding Keng). Another reason may be hostility from some feudal lords. The authority of the Shang is far from unquestioned. Early China is one of the most isolated kingdoms in the world, with no river or sea trade with other states, only that between the various subject kingdoms along the river. Son of Tsu-hsin. Reigned 32 years. Son of Ch'iang-chia. Reigned 29 years. Son of Tsu-ting. Reigned 7 years. The country declines once more during the reign of Yang Jia. In the third year of his reign he sends troops to fight the barbarians of Danshan, while at least two of his immediate predecessors have had to fight another group known as the Blue Barbarians. It seems that outlying peoples are now being attracted towards the Shang civilisation, probably to its detriment. In an attempt to revitalise the dynasty's fortunes, P'an-keng moves the capital to Yin, thereby creating the amended form of the dynasty's name, Yin Shang. The country remains prosperous during his reign, experiencing a golden age. The chapter P'an keng in the classic work, Shangshu (the Book of Documents), narrates the transferral of the capital. Once there, P'an keng revives the old style of politics which had been used by the dynasty's founder, Tang the Perfect. He restores the authority of the royal court by curtailing the power of the feudal lords. Unfortunately, the dynasty's new prosperity is short-lived, and soon fails under the next ruler. Reigned 59 years. First historically verifiable king. Wu-ting is the greatest of the Shang after P'an-keng. He enlarges the territory under his control by conducting a war in Guifang which lasts for three years. The Di and Qiang barbarians immediately seek peace terms. Wu-ting subsequently takes Dapeng and Tunwei. At least some of his campaigns are led by his trusted consort, Fuhao (Lady Fu Hao) who, when she predeceases Wu-ting, is buried with a large collection of weapons which includes great battle axes. Important jade is supplied for the tomb by the Yuezhi, or Niuzhi, seemingly reliable trade partners of the Chinese kings. 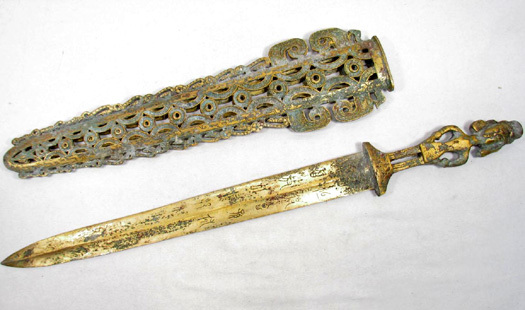 The collection amounts to more than 750 pieces, all from Khotan in modern Xinjiang, showing that the Yuezhi are already settled in the Tarim Basin. Social productivity is developed to a high level under Wu-ting, including aspects of textile manufacturing, medicine, and astronomy. His reign is one of great achievements. However, confusion over dating continues here, with alternate dates of 1238-1180 BC being offered for him and his successors following in sequence after this. Zu Jia fights the Rong people (or Xirong) whose homeland is located to the west of the Shang kingdom, past the headwaters of the Wei River. The fighting lasts a year or so, entering the thirteen year of his reign, before the western Rong people send an envoy to negotiate. The name 'Rong' seems to be more an indication that a group is an enemy of the king rather that a specific people named Rong. The term is used later in Chinese history, most notably as the name of a state during the Warring States era. Wu-yi is credited with raising Dan Fu, ancestor of the later Zhou dynasty, to the position of lord of Qi. Dan Fu's direct descendant, Wu Wang, leads the rebellion against desperately poor Shang leadership in 1122 BC, overthrowing the dynasty in favour of one of his own. Wu-yi also defeats the warring brothers who are contesting for control of Yiqu after Wu-yi had captured their father. Now the Shang king defeats them both and annexes Yiqu. Uncertain. Not included in all lists. May be the same as Tai Ding. Son of Wu-yi. Reigned 3 years. Even prior to their rebellion in 1122 BC, the early Zhou lords do not always enjoy good relations with the king. Tai Ding has Li Ji (Jili), the duke of Zhou, imprisoned where he later dies. The worry was that the Zhou lord had been becoming too successful in defeating various Rong groups and increasing his own territory at the expense of the Shang. Di Yi's eldest son is Prince Qi of Wei. Qi does not succeed his father. Instead he is so disgusted by the apparently evil conduct of the kingdom's governance that he leaves the royal court. He but is later granted the position of duke of Song by Wu Wang of the Zhou dynasty. Meanwhile Qi's younger brother gains the throne and leads the Shang to disaster. Son. Reigned 33 years. The last Shang emperor. The country is in turmoil and vassals from other countries begin to rebel. Despite the turmoil and the impending uprising, Zhou leads a luxurious life and tortures both his ministers and his people. This intensifies conflicts across the kingdom, and even the heavens seem to withdraw their mandate for the Shang to rule. A planetary conjunction of Mercury, Venus, Mars, Jupiter, and Saturn takes place, something that occurs once every 516 years. Thanks to this, modern science has pinpointed the omen precisely to 1059 BC (which means that all dating for prior events requires the revision which the alternate dates above have supplied). The omen is taken as a sign for the Shang's subject tribes to unite, under the leadership of the virtuous Wu Wang of the Zhou tribe. The Shang dynasty is finally overthrown at the Battle of Muye, ending their long reign. King Zhou commits suicide by walking into the fires that are consuming his palace, but the victorious Wu allows Zhou's son to govern the Shang tribe as a vassal under the title of the duke of Song (see below). The Zhou were another group of Yellow River Chinese, people who had developed their growing civilisation from the Longshan culture of the third millennium BC. They had gradually migrated towards northern China's westernmost agricultural basin, the lower Wei River valley in what is now Shaanxi province. During the Shang dynasty period they began to develop Shang-style agriculture here, and they also built a city in an area named the Plain of Zhou, which gave its name to the state and the subsequent dynasty. The Shang ruling class considered the Zhou to be 'semi-barbarous country cousins', but the two existed alongside one another in a general state of peace. Under the Zhou (pronounced in English as 'Jio' but with a very soft 'j' that is almost an 'sh' sound), people began to use the twelve branches system to record time and set solar terms to guide agriculture. An accurate eclipse is record in this period (899 BC), which means that the timeline becomes much more certain, and branches of medicine also appeared. The first Zhou king, Wu Wang, also laid down the rules for all later Chinese leaders - rulers must be virtuous and should maintain harmony between humanity and the cosmos by observing the rights and the music of the heavens. Some of the Zhou rituals survive to this day, deeply imbued in Daoism, the oldest of China's faiths. This dynasty should not be confused with the independent Shu state which was conquered by the Qin in 316 BC, during the 'Warring States' period. 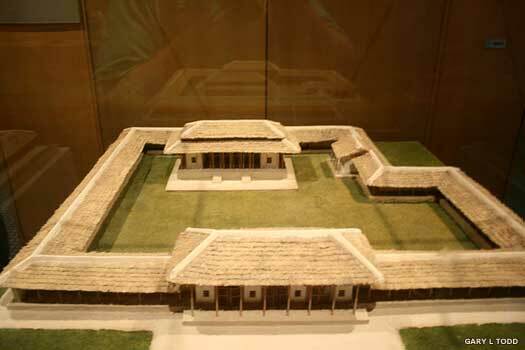 The early Zhou capital was at Hao or Haojing, a new construction of the late twelfth or early eleventh century BC. A secondary capital was soon built by Zhou Gongdan on the eastern plain to control the Shang. The dynasty's first king, Wu Wang, was the grandson of 'Duke Dan Fu', the lord of the fiefdom of Qi. Dan Fu was raised to this position during the reign of the Shang's King Wu-yi. His son was 'King Wen' (died 1151 BC, recalculated to 1056 BC), who became overlord of the Zhou during the dying days of the Shang dynasty. King Wen is credited with conceiving the ambitious plan of undermining Shang authority by concluding alliances with neighbouring chiefs. This gave the Zhou the military power to make conquest possible. Wen's growing power disturbed the Shang court to the point that they imprisoned him in the city of Youli. However, Wen's supporters ransomed him by giving the Shang a large number of gifts. His second son was Wu Wang, who led the rebellion against what had become desperately poor Shang leadership in 1122 BC (recalculated to 1046 BC or 1027 BC in some chronologies), overthrowing the dynasty in favour of one of his own. The Zhou never governed an entirely-unified realm. The Zhou court extended its power over the former Shang stronghold of the eastern plain by granting authority to members of the royal family and in some cases to favoured adherents, who established walled forts supported by garrison troops amongst the original habitants. In some cases, local chiefs were accepted as Zhou supporters. Thanks to this process of decentralisation, a network of city states came into existence on the plain, from which military and political control spread over the surrounding farming villages. Any local leader who challenged the Zhou order was quickly punished by the army and the regional delegates were closely watched. Western Zhou. Great-grandson of Duke Dan Fu, lord of Qi. Son of Zhou Shang, vassal ruler of the Shang as the duke of Song. Wu Wang dies at a relatively young age, and without having completed his conquest of the eastern plain which had been a Shang stronghold. Wu's brother, Zhou Gongdan, now acts as regent for the king's young son. Thanks to his fiefdom being based around the Zhou capital of Chengzhou, Gongdan is also known as Zhou Gong, Zhou Gong Dan, Shu Dan, Zhou Dan, and the duke of Zhou. Young son of Wu. Died 1021 BC in recalculated calender. Uncle and regent. 'The Duke of Zhou'. 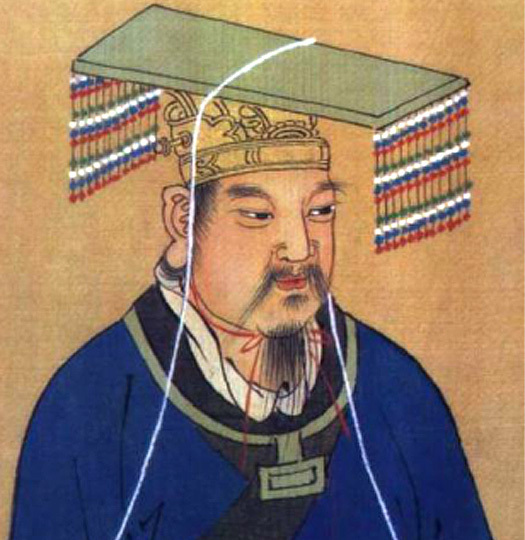 Zhou Gongdan's surviving brother, the duke of Shao, has been in command of the Zhou homeland in Shaanxi. Once Zhou concentrates on the regency and a way of consolidating Zhou command of the eastern plain, Shao and other brothers join the Shang, probably still under Wugeng Lufu, in the Three Governors' Rebellion. While such support may seem odd, the rebels may fear that Zhou Gongdan could be planning to usurp the throne. Zhou Gongdan organises his forces rapidly and crushes the rebellion. A number of campaigns follow in which he consolidates Zhou control of the entire Yellow River plain. Many existing minor states are cleared away by this process and are replaced by new administrative units, and a new secondary capital is built at Luoyang (in modern Henan Province). Son. Ruled 24 or 27 years. This reign incorporates the dating 'gap'. Another earthquake shortly after 1000 BC may be the culprit in the mysterious disappearance of the Sanxingdui civilisation. The massive temblor may cause catastrophic landslides, damming up the Sanxingdui culture's main water source and diverting it to a new location. This in turn may spur this ancient Chinese culture to move closer to the new river flow, abandoning its previous dwellings and perhaps founding the subsequent Jinsha culture. Son. Ruled 20 years. Killed in battle. During his reign, Zhao Wang pursues ever greater control over the Yangtze basin, a region of great mineral wealth which lies to the south of the Zhou kingdom. It is controlled by the Chu confederation and has been for about two centuries. While not part of the Zhou kingdom, the Chu have enjoyed good relations with it and its Shang predecessor during that time. Zhao invades Chu in 961 BC. All twenty-six states of the Han Valley are subdued, along with Chu itself, but Zhao retreats with the loot he has gathered, possibly unable to secure his conquests. Zhao Wang marches back into the Yangtze region but his campaign is a disaster. Rather than bring the Yangtze under his control, his forces are defeated and destroyed, almost to a man. It is alleged that Zhao and his generals drown while trying to cross the Han River. The chronology for the Zhou now becomes less certain and more poorly documented. Later calculations for reignal dates often contradict one another and this, along with the older dating which has the dynasty starting in 1122 BC as opposed to the new dating of 1027 BC means that no dates can be quoted with certainty. Son. Ruled 37 or 54 years. Son. Ruled 22, 17, or 15 years. Son. Ruled 7 or 26 years. Solar eclipse in 899 BC. Uncle. Usurper? Ruled 5 or 6 years. Son of Yi Wang. Restored by 'many lords'? Ruled 7 years. Son. Ruled 15 or 36 years. Exiled by the nobility. Died 828 BC. This is the first solid date in Chinese chronology - 841 BC (although 842 BC is a valid alternative calculation). The later writer Sima Qian is able to construct a realistic history back to this date, but unreliability in the records prevents him from going back any further. By now the ties of kinship which have always bonded the regions in their service to the Zhou king have loosened. Local rulers have gradually identified themselves less with the Zhou court and more with their allocated territories. This tendency has become very strong in the larger peripheral states. Now regional leaders have started to ignore their duties to the Zhou court and are also fighting amongst themselves. The declining order in the realm encourages non-Chinese on all sides to penetrate the kingdom's borders. King Li is exiled by the nobility and the throne is held open for his young son during the period known as the Gonghe Regency (while Li still lives). 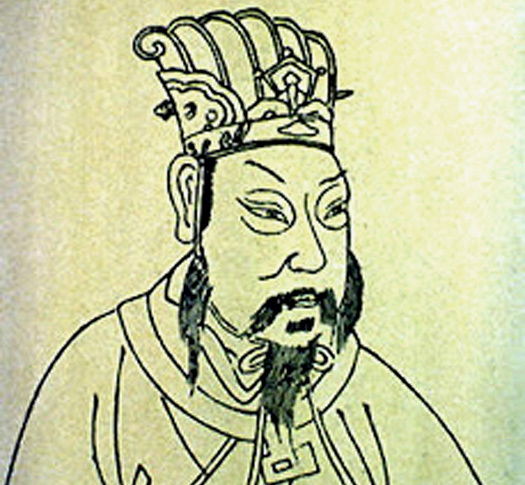 Upon his father's death in 828 BC, Xuan Wang accedes to the kingship in 827 BC. The holder of the regency is uncertain, with two opposing versions being offered. The first is that the dukes of Zhou and Shao - successors to the two brothers of King Wu Wang at the start of the dynasty - share the role, while the second is that Count He of Gong is sole regent. Son. First certain reignal dates. You Wang has demoted and exiled his queen in favour of a beautiful commoner named Bao Si. Understandably insulted, the queen's father, the marquis of Shen, sides with the northern Quanrong (Chuan-Rong) barbarians. The result is that You is killed during their invasion of Haojing, the capital city, when the city is overrun and sacked. Bao Si is captured but is allowed to resettle away from the capital. However, during a later attack by Quanrong barbarians she hangs herself rather than be captured again. The royal heir and some members of the court who manage to survive the disaster decide that Haojing is now too vulnerable to assaults from the frontier. They abandon the city in favour of the eastern, secondary capital at Luoyang. This shift in focus ends the Western Zhou period and virtually unquestioned Zhou power in favour of the Eastern Zhou period and a series of internecine conflicts. The Western Zhou emperor, You Wang, demoted and exiled his queen in favour of a beautiful commoner named Bao Si. Understandably insulted, the queen's father, the marquis of Shen, had sided with the northern Quanrong (Chuang-Rong) barbarians. The result was that You was killed during their invasion of Haojing, the capital city, when the city was overrun and sacked. The royal heir and some members of the court who managed to survive the disaster decided that Haojing was now too vulnerable to assaults from the frontier. They abandoned the city in favour of the eastern, secondary capital at Luoyang (very close to the western edge of the ancient cultural centre of Erlitou). This shift in focus ended the Western Zhou period in favour of the Eastern Zhou period. The period between 722-481 BC (the precise dates are somewhat variable) is known as the 'Spring and Autumn Period', after the annals of the same name which are traditionally assigned to Confucius. By this stage in Chinese history, the central kingdom governed a great many tribes and smaller kingdoms, all vassals, but all struggling against one another for regional superiority and even against the ruling king for dynastic supremacy. The country was frequently in turmoil, but out of that turmoil evolved the same evolution of philosophy and a spirit of examination of all the world contained that was starting to take place in contemporary Greece. Many of the ideas being developed by figures such as Laozi, Confucius, Mencius, and Mozi, all of whom lived during the Eastern Zhou period, would shape the character of Chinese civilisation right down to the modern day. Son of You Wang of the Western Zhou. Founded Eastern Zhou. With the disruption caused by the barbarian invasion, the abandonment of the capital, and the relocation to Luoyang, divisions appear within the kingdom. Duke Jī Hàn of Guó now raises one Jī Yúchén as a rival king under the title of King Xie of Zhou. Not much is known of Jī Yúchén - even his throne name actually seems to be the name of the location at which his accession is pronounced (although where that location may be is not known). As he is raised with the assistance or support of the Quanrong barbarians and does not seem to be a direct descendant of King You Wang, he is viewed as a pretender. His death in 750 BC ends the rival claim to the throne. Rival king. Killed by Marquis Wen of Jin. This is the 'Spring and Autumn Period' of Chinese history. The country is divided into many small states, all of which are frequently at war against one another, and sometimes even with themselves. The Zhou emperors still reign over most of them, but largely in name only for long periods. The Yue state which, in the Xia dynasty period and according to tradition, had been founded by Wuyi son of Emperor Shào Kāng, is now flourishing as one of those small independent states. By this time the weakened and relatively obscure Zhou emperors can excerpt very little control over events in the kingdom. In fact they are no longer even the most powerful force in the Chinese realm - that honour goes to Duke Huán of the Qi, one of many rival states which are now independent kingdoms in all but name. Qi (or Chi in older English-language materials) sits on both sides of the mouth of the Yellow River. The Yuezhi reside on the border of agricultural China, having been there for longer even than the seemingly ever-present Xiongnu. While the Xiongnu become famous in history for their conflicts with various Chinese kingdoms, the Yuezhi are better known to the Chinese for their role in long-distance trade. The economist of this period in time, Guan Zhong, refers to the Yuezhi, or Niuzhi, as a people who supply jade to the Chinese (and have done since at least the twelfth century BC when they had supplied the jade for the tomb of Fuhao, a royal consort of Wu-Ding of the Shang dynasty). In a sign of how destabilised things have become, Xiang Wang himself is driven from the capital by his own brother, Dai Wang. This event is sometimes known as the 'Chaos of Prince Dai'. Duke Wen of Jin restores him and kills Prince Dai, but his reputation is very likely damaged. Under Duke Wen, Jin has greatly expanded its own territory, making him the state's most powerful sub-king or warlord. Until recently, the accepted theory has been that the Thai people originate around this time in north-western China, and migrate southwards to Thailand. Once there, they split into two main groups; one settles in the north and founds the kingdom of Lan Na, the other settles further south to found the kingdom of Sukhothai. A modern theory suggests that the migration takes place in the opposite direction, from Thailand to China and elsewhere, with the Thai people setting up their own native kingdoms and also migrating outwards. Confucius is born in the town of Qufu (pronounced 'chufu'), which is the capital of the warring kingdom of Lu. 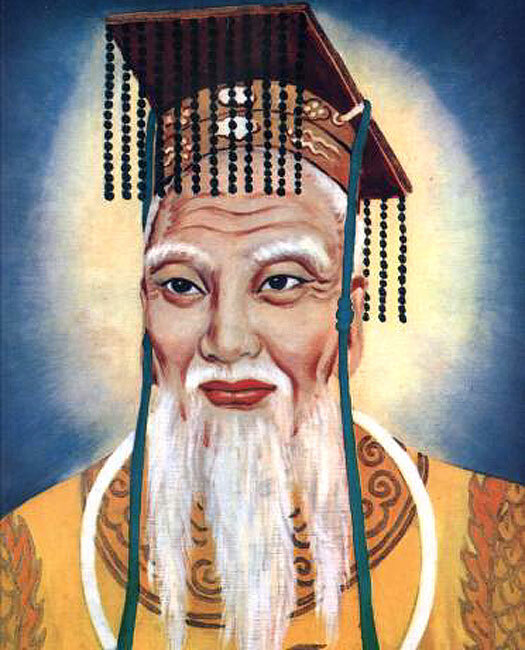 His name in English is a Latinisation of his Chinese honorific, K'ung Fu-tzu, which is comprehended as Kong Fuzi by Jesuit missionaries in the sixteenth century AD. Confucius' parents had migrated from the Song state to Lu, and Confucius himself is a direct descendant of the Shang nobility, via their reduced successors, the lords (or dukes, in western terms) of Song. One of his early accomplishments in his twenties, in what has become a fairly high-level ministerial role, is to act as a peace broker between three ruling clans within the Lu state - the Jisun (or Ji), Mengsun (or Meng), and Shusun clans. He persuades them to demolish their fortifications and acknowledge the duke as their lord. This success helps him realise that his true goal in life should be to restore civilisation by teaching rulers to be virtuous. Only this and the ability to rule with morality would preserve the Chinese state. Son. Killed by his brother, Prince Chao. Brother. Succeeded by his son, Yüan Wang, of the Late Zhou. The Warring States period of Chinese history was a long time in coming. The durable Zhou dynasty had presided over a gradual and seemingly unstoppable fracturing of the ancient Chinese kingdom which was focussed on the Yellow River territories. During its Middle Zhou period, the various subjugated territories - never entirely conquered in the sense that they merely became regions of a single state - assumed more and more power and began fighting one another for dominance under Zhou imperial overlordship. Then they began to challenge the Zhou themselves and that overlordship became nothing more than a label of convenience. The 'Partition of Jin' in the central and northern Zhou empire between 481-468 BC witnessed the gradual dismemberment of the powerful Jin state as its territory was sub-divided amongst family members. Divisions occurred in 481 BC, 475 BC, and 468 BC, and resulted in the creation of the states of Han, Wei, and Zhao (from south to north respectively). The process was completed in 403 BC by Emperor Weillie Wang's recognition of the division, but the 'Warring States' had already begun and the fracturing of China's early single kingdom was complete. The date of 475 BC and the end of the Middle Zhou is most usually accepted as the start of this period, although 481 BC is used here to signify its trigger point. The Eastern Zhou continued to rule a much-reduced territory during the Late Zhou period in the face of opposition between as many as seven other kingdoms. These included the Qin kingdom, which ultimately conquered them all, along with the Chu, the 'Three Jins' of Han, Wei, and Zhao, and the Qi and Yan kingdoms. The states of Ba, Shu, Yue, and Zhongshan also provided some independent opposition until they were conquered. Towards the end of the Warring States Era, when the Chinese states were preoccupied with their struggle for superiority, the Xiongnu mounted nomads became a real threat to the north-western Chinese border. Further afield, by this time the (Lesser) Yuezhi, formerly reliable jade traders to the Chinese, were better known as reliable horse traders. Jade was still included in trade, however. Seemingly also during this era, and probably towards the end of it, the Greater Yuezhi appeared alongside the Xiongnu, somewhat to the south of the Eastern Steppe. Fortunately for the Chinese, the Greater Yuezhi occupied the Xiongnu in various conflicts, deflecting them from the Chinese lands themselves. 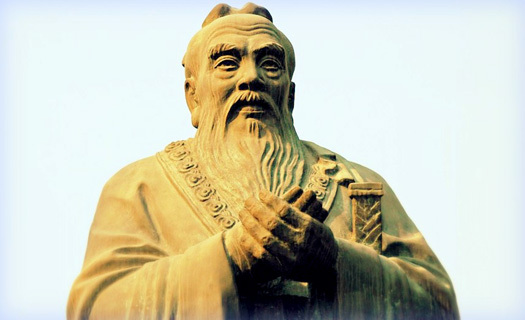 In a period which saw the Bronze Age in China being replaced by the Iron Age, Confucius (K'ung Fu-tzu) passed away (in 469 BC), having so far failed in his mission to bring virtuousness to the country's rulers and moral values to the method of their rule. The warring states continued to fight until after the last of the Zhou had fallen, but the ideas that Confucius left behind were taken up by his disciples, generating the 'Hundred Schools of Thought' period of Chinese philosophy. In time, despite repression by the subsequent Qin imperial dynasty, the ideas that were laid down by Confucius would eventually reached a much wider audience.